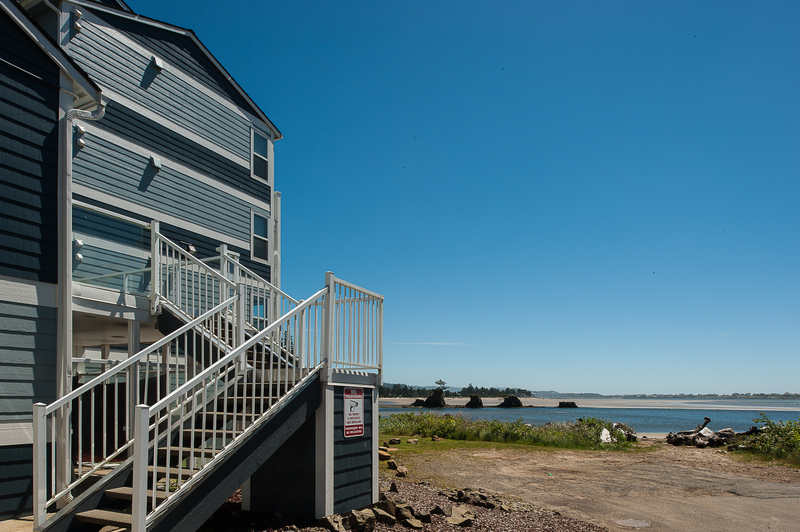 Welcome to Waters Edge 108, located on the Siletz Bay in Lincoln City! This beautiful two bedroom, one bathroom condo is perfect for you and three guests! 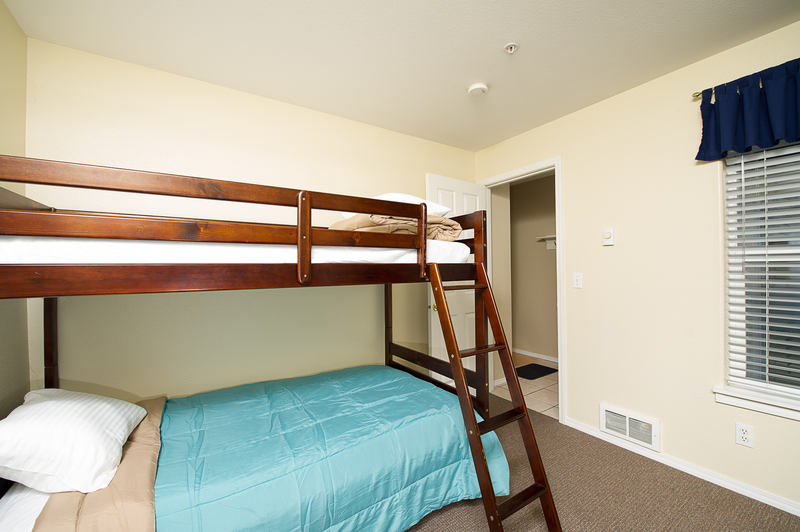 With bottom floor access, you won't have to travel the stairs or the elevator to get all moved in! 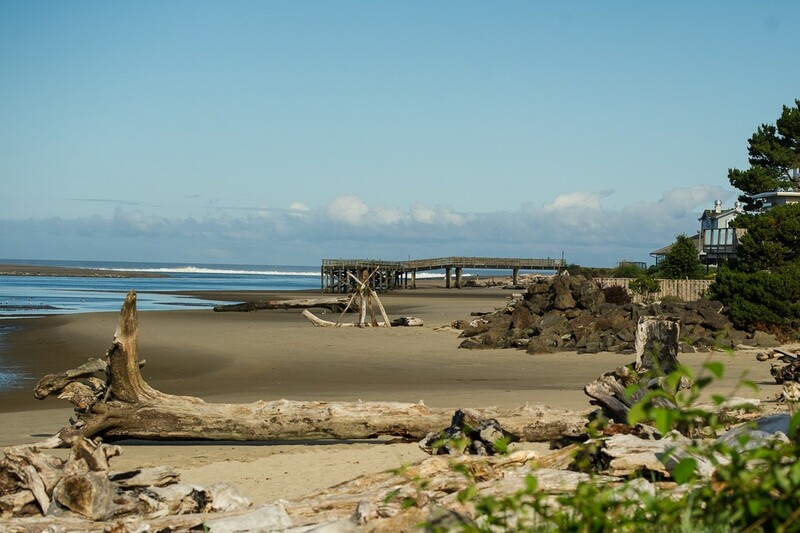 You'll also have a wonderful view of the Siletz Bay from your back deck. With beach access this close, you'll want to come back again and again! Located in the Taft district, you'll be within walking distance of not only the beach, but several delicious restaurants, two glass blowing studios where you can create your own one of a kind glass blown art piece, and even a grocery store. Walk through the front door and you'll find the first bedroom right inside! 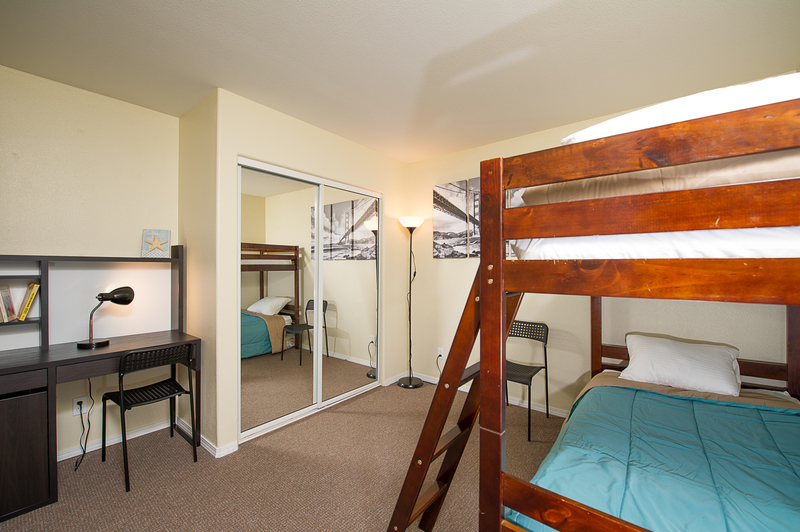 This room is perfect for the kids, with a set of bunk beds and a desk. The next room is just a little bit up the hallway, with a queen size bed and a large flat screen TV. 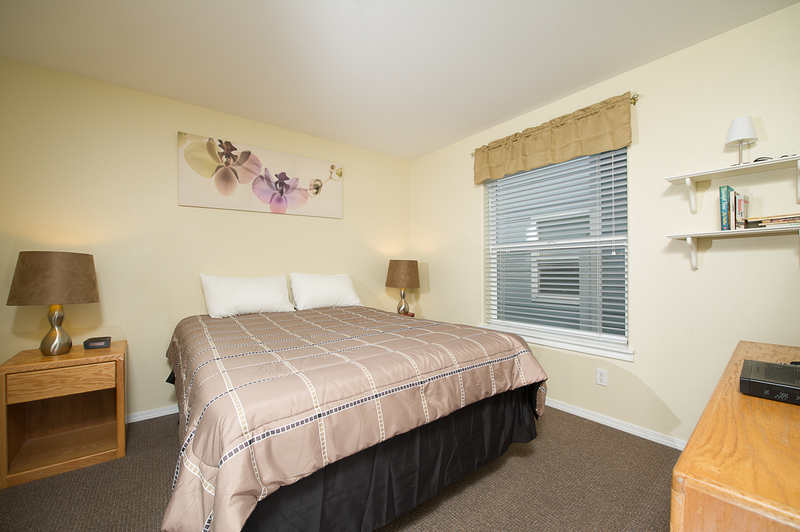 You and your loved one can relax in comfort and style in here, with the bathroom area just outside of the room. There is also a washer and dryer at this home, so no need to pack extra heavy! 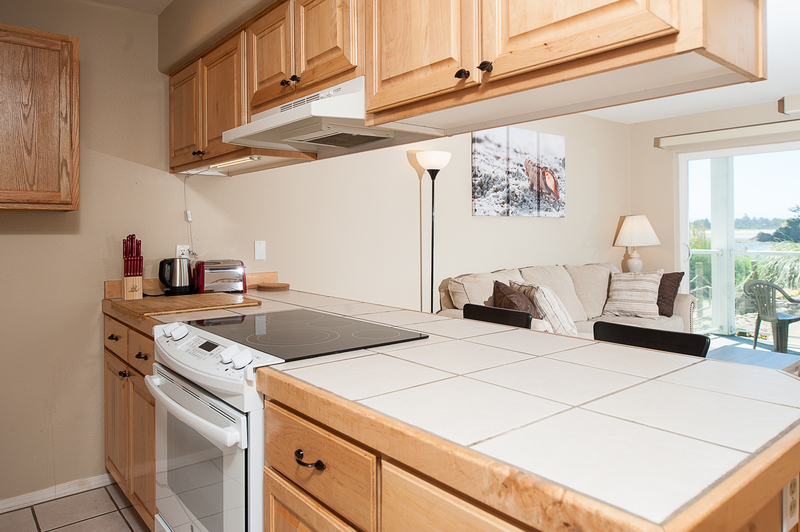 Walk a little farther and you'll find the kitchen and the open living area, complete with a fireplace and TV. You'll also have access to the back deck, where you can sit outside and watch the people on the beach, or just drink in the salty sea air! The kitchen is fully functional with everything you need to whip up some homemade meals, and then enjoy them at the dining room table. There's even an outdoor barbecue for you to use if you'd like some steak and ribs, or burgers and hot dogs on a warm summer night! What are you waiting for? Pack your bags and head down to Lincoln City! Waters Edge 108 is one you and your family are sure to love! Beautiful walk to the ocean! "As others have mentioned, the condo could’ve been more clean but was overall very nice and decorated very comfortably! Pros:The beds were clean and comfy, the linens and towels were clean and fresh. Fireplace was relaxing. The condo was actually more spacious than I thought it would be! We walked about 10 minutes to Mo’s for dinner and the grocery store is about a 5 minute walk! The bunk bed had an extra twin mattress tucked under it which came in handy for the kiddos! Cons: -Key pad wasn’t set so we had to call to have the code re-set to get in the unit.-The kitchen was lacking a few necessities but not the end of the world.. Just something that would be nice to be added for future guests...No baking sheet, No large frying pan. Had to go buy salt (we left it for the next guests :)-kitchen/living room floors were pretty dirty. ie: sitting on the chair, you can see lots of food and things built up under the couch across the room.We really enjoyed our stay and we’d stay again. Thank you! " "Hello Natalie, Thank you for your review. We are glad to hear that you and your family enjoyed your stay at Waters Edge 108. It sounds like you all had a fun time visiting the beach and walking around the Taft area of Lincoln City. We are sorry to hear that you had a few issues with the unit, but we are glad that we were able to help where we could. We would have gladly sent housekeeping back to the home to remedy some of the cleaning issues for you. We will also look into getting more items in the kitchen. Thank you for bring these items to our attention. We look forward to having you back again soon. Thank you again for your review." "Arpad - thank you for taking time to send in your review. We are pleased to know you enjoyed the Waters Edge unit and found the unit to be clean and comfortable. Hope memories were made to last a lifetime. We would enjoy hearing back from you to assist in planning your next coastal getaway." "One of our favorite parts of our trip was sitting on the glass in patio surrounded by roses drinking our morning coffee and evening wine. The unit was easy to find, there was plenty of parking, and we were able to walk down the beach just a little ways to a nice restaurant with a view. The beds were comfortable and we didn't feel crowded at all. The kitchen and bathroom had plenty of utensils, plates, soap and sponges, paper towels, bath towels, etc. We felt like we had all the Comforts of home as opposed to a hotel. Little touches like the fireplace and plenty of hooks for coats and hats by the front door really made us feel welcome. I took my dad for Father's Day, and now he wants to make it an annual tradition to rent out that unit." "Hello Natasha, Thank you for your review. We are so pleased to hear that you and your father had a wonderful stay at Waters Edge 108. It sounds like it was the perfect Father's Day, and we are excited to be a part of this new tradition. We look forward to seeing you both again next year on the Oregon coast, and thank you again for your review!" "This was my second stay in this condo, love this place so much! Clean, well stocked, and close to Mo’s. We went crabbing on the dock at Mo’s and then went and had lunch at Mo’s. It’s an easy walk right to the restaurant, and the IGA is within walking distance too. If you don’t want to spend a ton of money on groceries, it’s a good idea to stock up at the safeway that’s on the other side of Lincoln City. It was pouring down rain and snow while we were there, it was so nice to sit by the fire and warm up. We read books, and also enjoyed the free WiFi. Having a washer and dryer in the condo is so nice, it makes for light packing! " "Hello Olive, Thank you for your review. We are glad to know that you had an amazing getaway at Waters Edge 108. It sounds like this unit has become your new go to! We hope to have you stay with us again in the future. Thank you again for your kind review." Have already booked my next stay here! "Perfect condo for a quick get away. Full kitchen great view, and bunk beds for the kids! We walked to Mos for dinner on the beach, we went clamming and it was so nice to be able to wash all our clothes before we came home! Very comfortable condo!" "We are so happy, you enjoyed your tiime at the beach!! See you again soon!" "Our stay was great, a weekend get-away. Never stayed in this room before, but have stayed at this location many, many times. Always a nice get away." "Hello Sharon, Thank you for your review. We are glad to hear that you loved your stay at Waters Edge 108! We hope to see you back again soon on the Oregon coast!" "As always my stay was very relaxing. stayed 11 days and it was the longest stay ever. Still didn't want to go back home. I love staying at Water's Edge as I have stayed in various condos. Thank you all for sharing your condos. I will be back 😁 thank you, thank you, thank you"
"Hello Linda, Thank you for your review. We are glad to see that you enjoyed your stay at Waters Edge 108. We are happy that you had another great getaway to one of our Water's Edge units. We hope to have you come back again soon!" "Hello Linda, Thank you for your review. We are glad to hear that you had a great stay at Waters Edge 108! We look forward to hosting you again soon!" "Good except grill was a mess. Had to scrub it before could use. Ground floor was great to pack in & out. Work crew outside were good about letting me pull close to my room even though they had blocked off parking spaces. Overall good space, but pretty sparse in dishes/silverware. " "Hello Sandra, Thank you for your review. We are glad to see that you enjoyed your overall stay at Waters Edge 108. We are sorry to hear that you encountered a few issues with the unit. We would have happily sent someone over to clean the grill for you. As for the dishes/silverware issue, this has since been remedied. Thank you again for your review, and we hope to have you stay with us again soon on the Oregon coast." "Overall the condo was pretty good... it was just very disappointing that the floors had sand upon arrival, the blinds handle was laying there broken and upon arrival we had to open the window in our bedroom due to there being a pot smell. Overall there just seemed to be quite a few things in need of repair but it wouldn’t keep us from staying here again. Please fix the way the dishwasher sits- you can’t easily shut or open the door! " "Hello Sarah, Thank you for your review. We are glad to hear that you enjoyed your overall visit to Waters Edge 108. We are sorry to hear that the unit wasn't as clean as it should have been for your stay. We are also sorry to hear that that there was a pot smell in the unit. Smoking is forbidden in all of our rentals, but some guests do not obey the rules. The dishwasher was replaced by the owner. The blinds have since been fixed. Thank you for bringing these items to our attention. We hope to have you stay with us again in the future." "Hello Rick, Thank you for your review. We are glad to hear that you had a great visit to Waters Edge 108! We hope to see you back again soon on the Oregon coast." "Condo was nice but the floors were dirty and the tub had lots of sand. I work from home so I took my work with me but couldnt connect to the internet because it was needing the modems code. Eventually the facility tech stopped by and the modem was hidden in the back of the tv. He was even having a hard time finding it. There was also a sewage smell coming from the kitchen and the fridge stunk like rotten food." "Hello Elizabeth, Thank you for your review. We are glad to hear that you enjoyed your overall stay at Waters Edge 108, but we are sorry to hear that you did experience a few issues within the unit. We would have happily sent housekeeping back out to the unit to resolve these issues for you Thank you again for your review, and we hope to have you stay with us again soon on the Oregon coast." "We enjoyed our stay, condo was easy to find. My only complaint was the bed in the condo; it must have been 15 - 20 years old and was hard as if sleeping on box springs. Unfortunately because of the bed we will not stay at this place again. I don't understand why a place would have such an uncomfortable bed in a vacation condo. Also, the bathroom needed some deep cleaning on the shower rod. " "Rented this condo so my Dad could have a nice stay after my Mom's celebration of life. It was all on one level and had a great view of the bay. It would've been perfect except, and this was my fault, my Dad needed something that was a little more accessible to a person with disabilities. The toilet in the bathroom is really low and it was really hard for him to get off it. Other than that it was a great place. I would try to rent it again for myself. 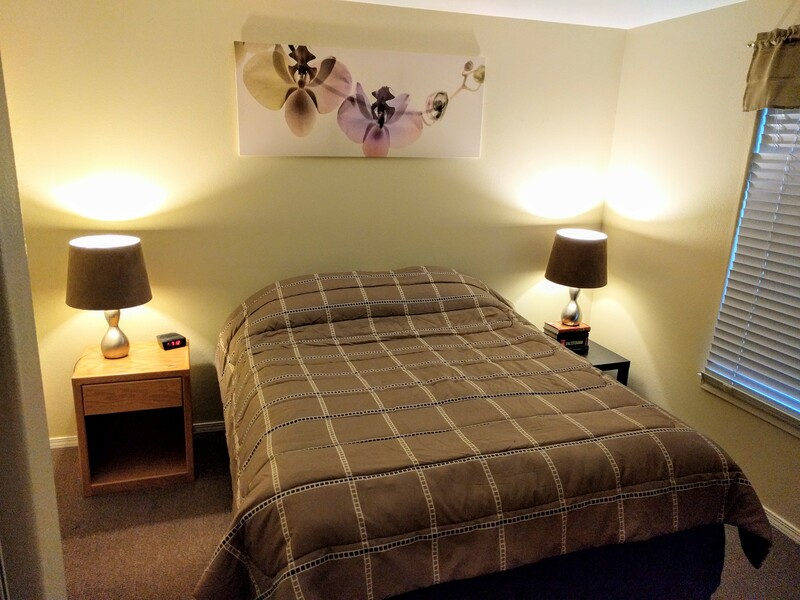 It was clean and very comfortable." "Hello Shannon, Thank you for your review. We are glad to hear that you enjoyed your stay at Waters Edge 108. It sounds like this unit was nearly perfect for your parents. We are sorry to hear that it wasn't as handicap accessible as you wanted, but we look forward to having you stay with us again in the future. We are glad to know that the unit was clean for their stay. Thank you again for your review." "We had a very nice stay in Waters Edge 108. However if you are sensitive to light at night, both bedrooms have lights that shine into the rooms. They are exterior building lights, so there is nothing the owners could do other than get dark curtains for guests to be able to close. Also the beds, in our opinion are not great. They are cheap and hard, maybe the owners could upgrade at some point. The rest of the condo was great. Very clean, very comfortable and close to beach access. New curtains and mattresses would make this close to a 5 star stay." "Hello Tonya, Thank you for your review. We are glad to hear that you enjoyed your overall stay at Waters Edge 108. We are sorry to hear that you encountered a few issues with the unit. We can pass this information along to our owners. Thank you again for your review, and we hope to have you stay with us again soon on the Oregon coast." "This condo is set on a bay that is effected by the tide. When the tide is high, you see water and its a pleasant view. When it is low (about half your daylight hours) not so pleasant unless you are clamming. You can't hear the ocean waves from the condo, but you can hear traffic noise from Hwy 101. The bathroom had sand along the walls and bath tub, greasy hand prints on the wall by the dining table, and it had an odor that we couldn't identify, but was possibly coming from the fridge (though it appeared clean on the inside) or behind the dishwasher. We should have called the contact number for these things but I don't like someone coming in after we've already "moved in" for our stay. When we called afterwards, they said they would have sent housekeeping to inspect, but again I didn't want to wait around for someone and I don't like anyone in "my space" when my stuff is there. There is no visible on-site office, you have to all someone (somewhere) so it didn't seem like there would be immediate support. RATES AND PRICE are also deceptive on-line: it was listed at $89 per night, but when you go to "book" there are added reservation fees, cleaning fees and taxes that brought it up to over $140 per night!! If none of the other issues matters to you, at lease BE AWARE of the final price before you book! Not as much as a bargain as we originally thought." "Hello Mark, Thank you for your review. We are sorry to hear that you did not have a good stay at Waters Edge 108. We are sorry that the unit seemed to have an unidentifiable smell. We will have this looked into. As for the calling in to speak to someone, our Lincoln City office is just a block down the road from Waters Edge. We would have been more than helpful if you would have liked to come in and speak to someone about everything in person rather than on the phone. As for our booking fees, you will find this with all hotels and VR companies. We are sorry if you felt that this was deceptive. We hope to have you stay with us again in the future. Thank you again for your review." "This was a pretty good rental as far as location. The view was beautiful and watching the tide come in and go out was a treat. It was also within walking distance to a grocery store, restaurants, museums and a couple of glass blowing factories. As for the condo, it was so-so. The full sized bed (not king as advertised) was very hard and the kitchen had a very small number of dishes. If there is only two in your party, the seating in the living area is sufficient. However it is a good value for the price." "Hello Ann, Thank you for your review. We are glad to see that you enjoyed your overall stay at Waters Edge 108. We are sorry to hear that the bed size does not seem to be listed correctly. We have looked at our website description, and it mentions one bedroom with twin bunk beds, and the other bedroom contains a queen. We are not sure what website lists that this unit contains a king sized bed. Thank you again for your review, and we hope to have you stay with us again soon on the Oregon coast."